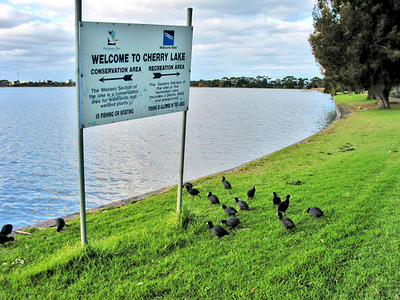 Though there aren't any cherries growing on any of this park's trees, Cherry Lake is a lovely park to go to if you want to have a nice stroll before work or have a barbecue with friends and family on the weekend. As most parks are, Cherry Lake is a family-friendly environment with options for all age groups to do there. There's a nice playground for the kids and a big hill for them to run up and down on that will tire them out. Or if they want to try to impress the other kids around, they could bring their bike or skateboard along and show off on the ramps there. As the name suggests, there is indeed a lake, and it is big! You will often see people jet skiing around or the lazier ones who will put their remote control boats in the water. People also go fishing here, so you may even score yourself a free dinner if you know your way with a fishing rod. If you are a sporty person, then there is plenty of room to chuck a footy or soccer ball around with your mates. There is also a 3.5 kilometre walking trail all around the lake if you feel like taking a look around while exercising, and your dog will certainly enjoy the trip too. The only real negative thing about Cherry is the nearby factories that are a bit of an eyesore and ruin the picturesque view all around you (Altona is an industrial area for the uninitiated). But fortunately they are far away enough to easily ignore (provided the wind doesn't blow pollution towards Cherry Lake!) for everyone to enjoy the beautiful surroundings around them.